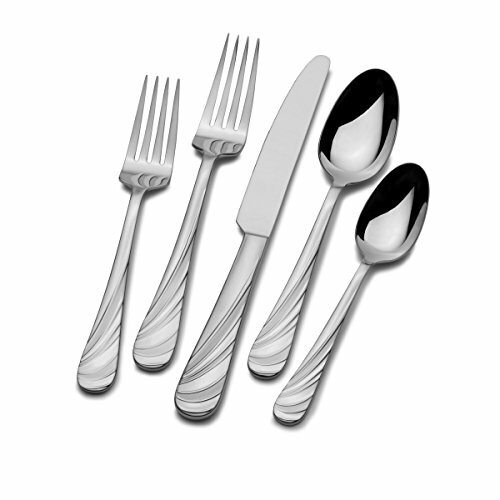 Swirl Frost Flatware, by Mikasa, is a beautifully finished silverware adorned with frosted and polished accents making for an unforgettably elegant table. This set is perfect for formal dinners, teas, and luncheons. The wide, tapering handles and flowing lines add graceful touches to any table. Crafted of superior quality 18/10 stainless steel. Dishwasher safe. 65 piece set, service for twelve, includes (12) each: dinner fork, salad fork, dinner knife, dinner spoon and teaspoon, plus (1) each: tablespoon, pierced tablespoon, cold meat fork, butter knife and sugar spoon.